At Seattle Opera’s Annual Meeting yesterday, Speight Jenkins announced the winners of the 2008/09 Artists of the Year Awards. 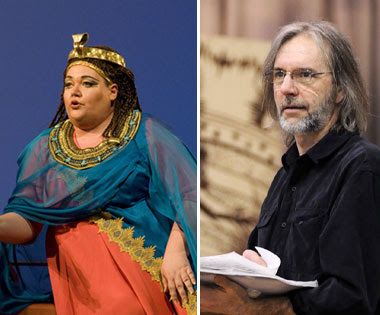 Mezzo-soprano Stephanie Blythe won the award for her portrayal of Amneris in Verdi’s Aida in August, and director François Racine won for his re-staging of Robert Lepage’s original production of Bartók’s Bluebeard’s Castle with Schoenberg’s Erwartung in February and March. If you missed Aida or just enjoy Stephanie Blythe’s performances, you have another chance to see her—and a whole host of wonderful singers—in this summer’s Ring. She sings Fricka and the Second Norn (which she has sung in all of Seattle Opera’s Ring productions since 2000), as well as Waltraute in Götterdämmerung. Congratulations to both Ms. Blythe and Mr. Racine, and thanks to all the amazing artists who made the 2008/09 season memorable! Fantastic! Miss Blythe is phenomenal, we're SO lucky to see such a fantastic artist here so often. By my count, it's about 24 days, 10-1/2 hours until she sings "Wotan, Gemahl! Erwache!" at "Rheingold" opening night! !